The transition from winter into spring brings forth a profusion of wildlife, blooms, and rainbows amid wild, kaleidoscopic skies. 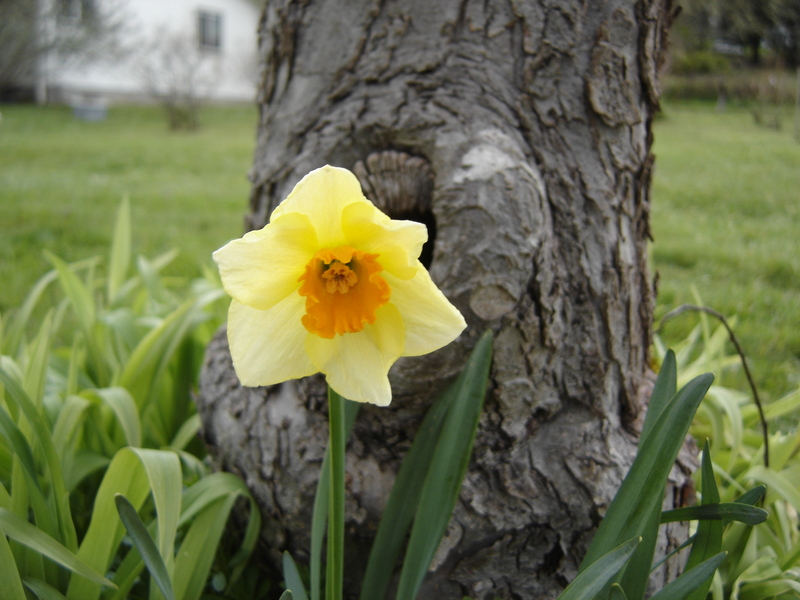 Our feature photo this month is a shy but comely daffodil residing by an apple tree near the house. 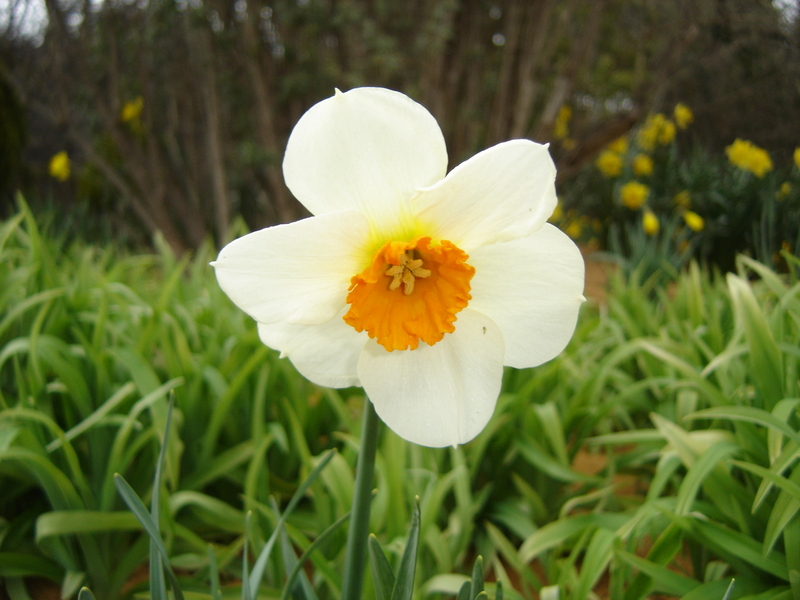 A single daffodil, tucked in near an apple tree in the previous year, presenting us with a smiling face this spring. Over time, these individual bulbs planted here and there will continue to divide, forming colorful islands in the sea of green. 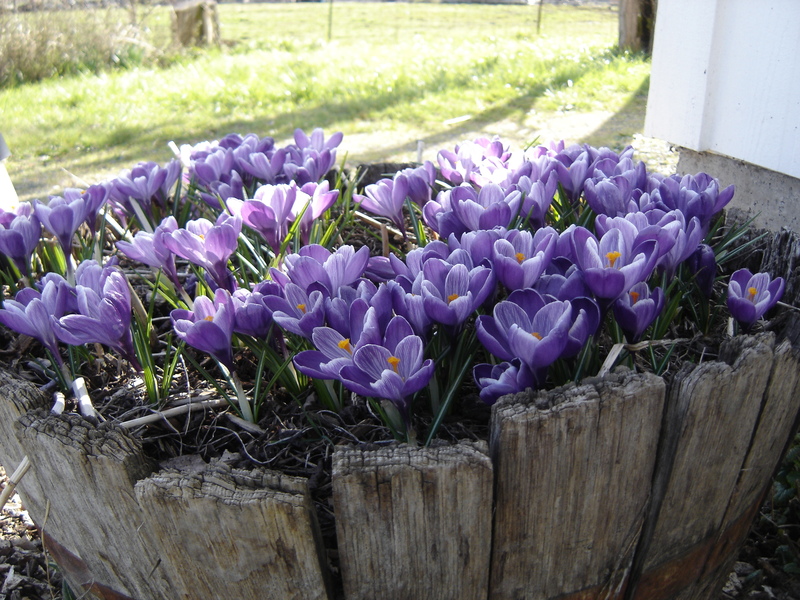 Protected from gophers, the old barrel of crocus did not disappoint us, putting on a spectacular show this year. A half-barrel of crocus on a sunny afternoon in March. 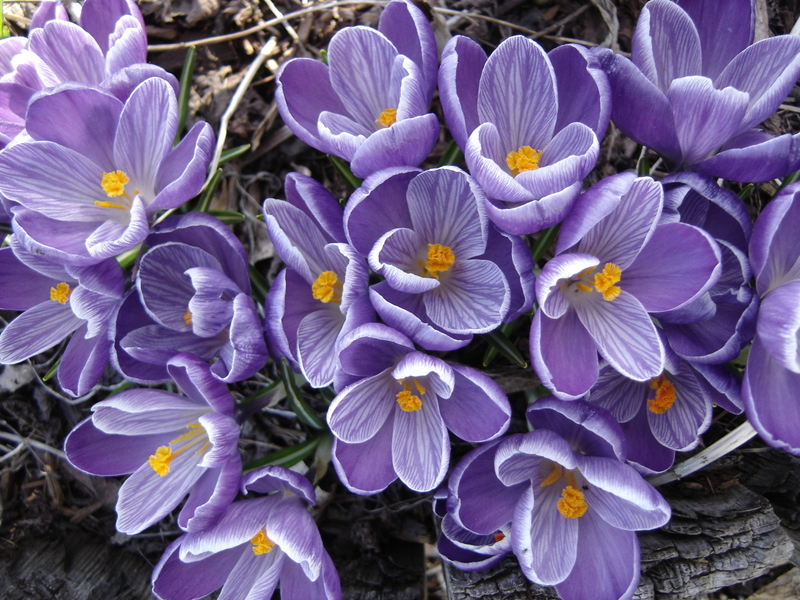 A cluster of crocus from the same barrel, in full orange-throated song, as only such a joyous spring flower can do. February passed the baton of cold weather on to March, although spring cannot readily be held back as the days lengthen and sunrise moves north along the eastern ridge towards equinox. Perhaps a blessing, cool late weather and early spring weather have kept bush, tree and vine in check from breaking bud and blooming too early. 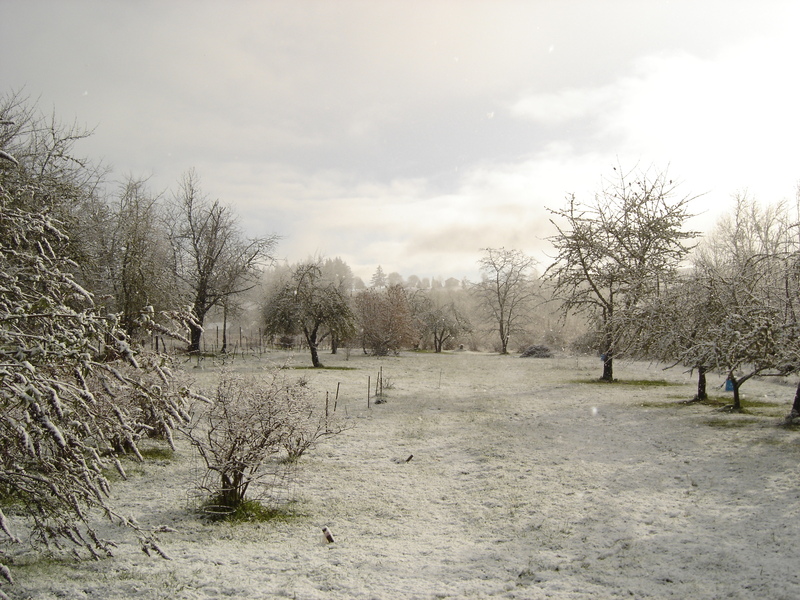 February 26th, another light covering of short-lived snow. 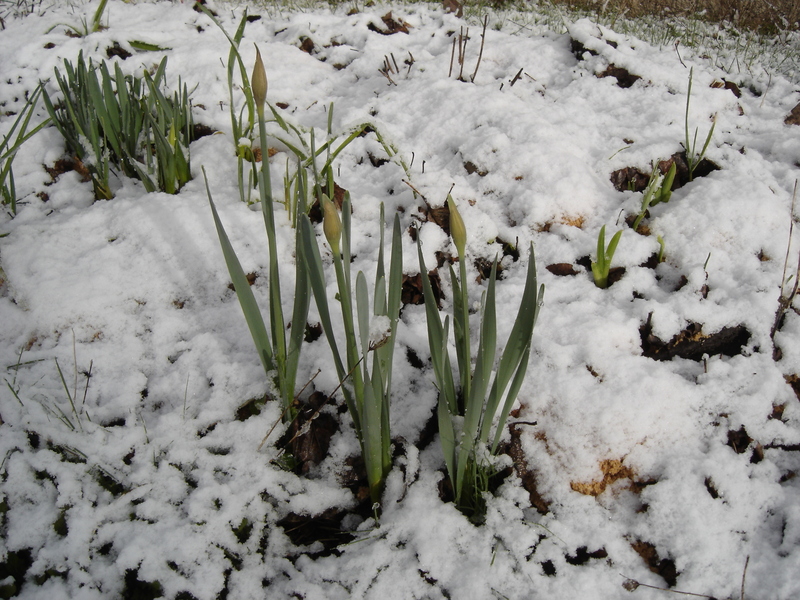 Undaunted daffodils, silently waiting to open their buds. Early March brought slightly warmer weather, and a return to green. 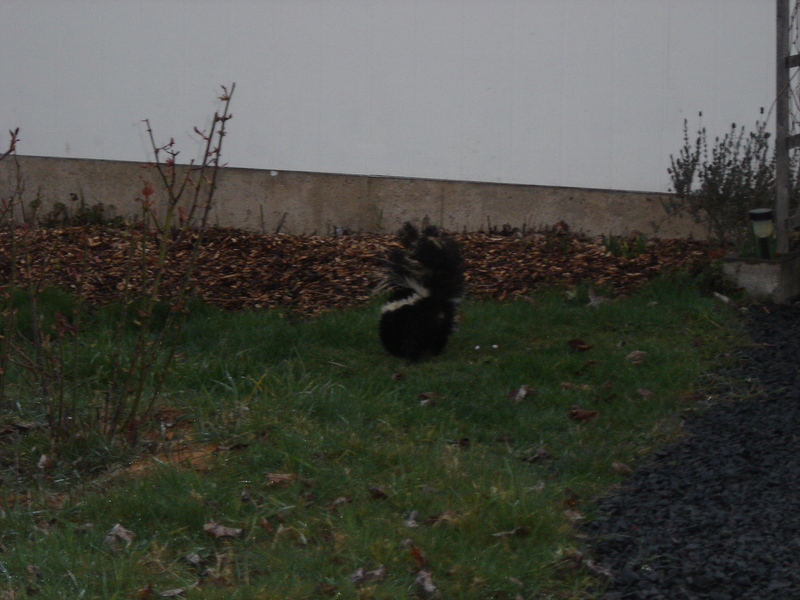 Stinklesby II, the first skunk of the season, came calling early on; inquisitive and hungry, he left his unmistakably scented calling card behind in many places, including the shed. He seems to have spent some time investigating that outbuilding, unfortunately. 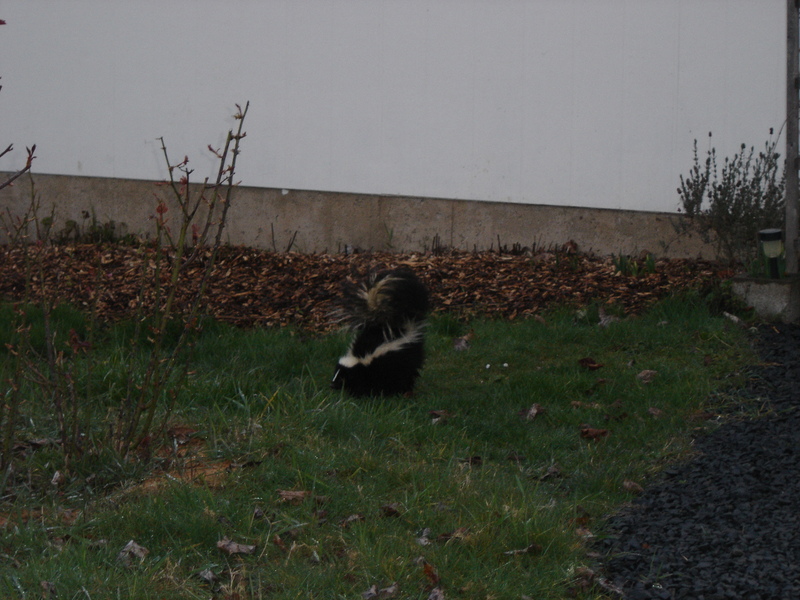 Stinklesby II, a handsome striped skunk, came to visit. I kept the flash off so as not to alarm him. Click on any photo in this post to enlarge. 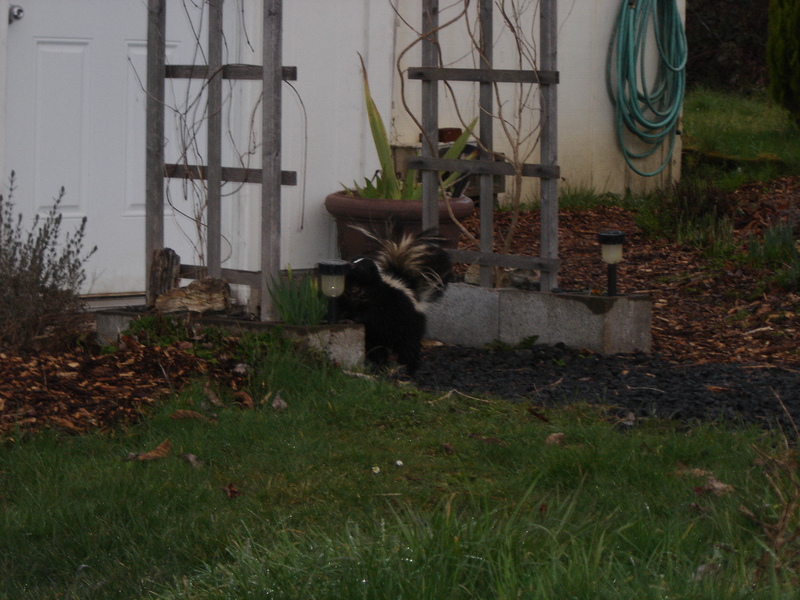 Stinklesby II investigating the solar path light. Stopping to smell the roses, although there are no roses blooming yet. Showing us the business end. The photo shoot came to a close! It is said they can accurately spray up to 10 feet. 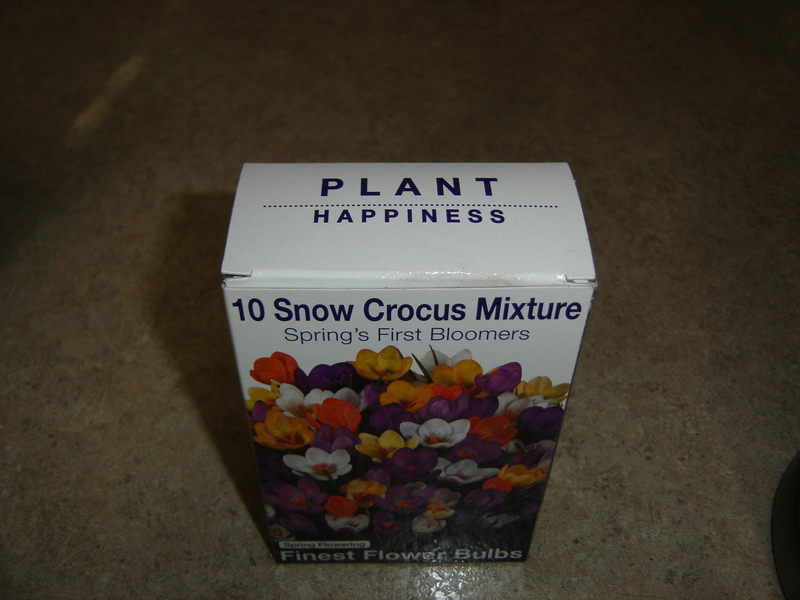 While the earth remained cold and wet, the first round of seeds were started indoors in preparation for warmer times. Tomatoes are ready for transplanting into larger pots, making room for ground cherries, something I have never tried to grow, in the seed start rack. Late winter changes continued to make themselves apparent in the local plants and animals, including myself. 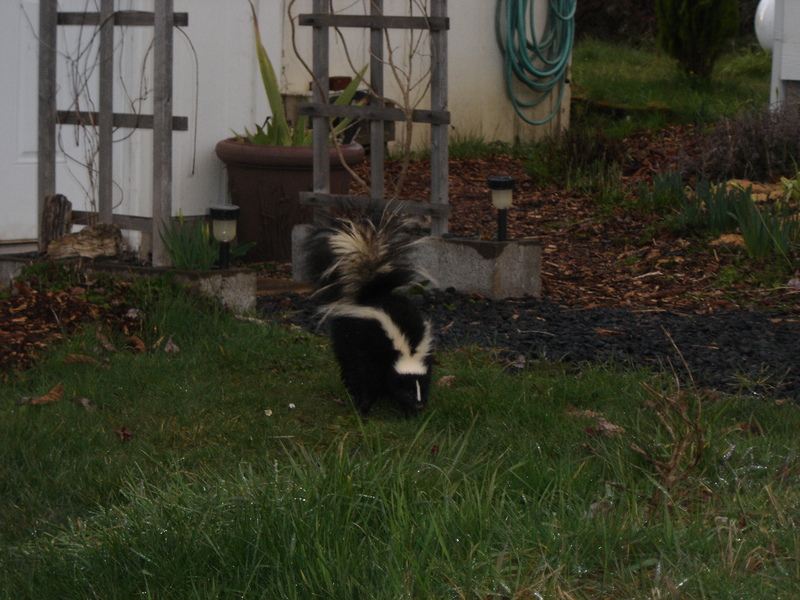 Like the skunk, I feel ready to shake off winter’s torpor and wander about, soaking up the still angled but warm sun. Everything is to be investigated, noted and logged; every ephemeral rainbow and passing cloud present a feast for the eyes to be appreciated. 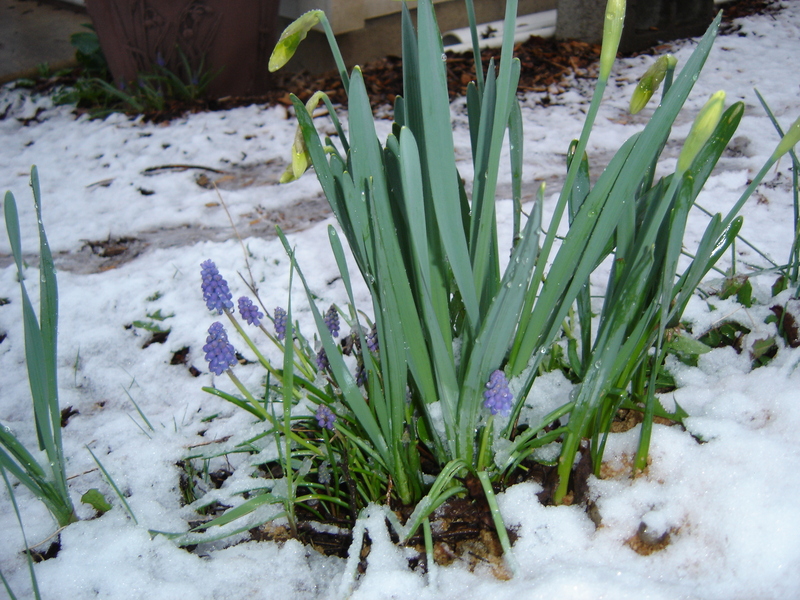 Daffodils and grape hyacinths were a bit dismayed at encountering snow again on March 23rd. Hopefully this storm closed the final chapter in winter’s book. 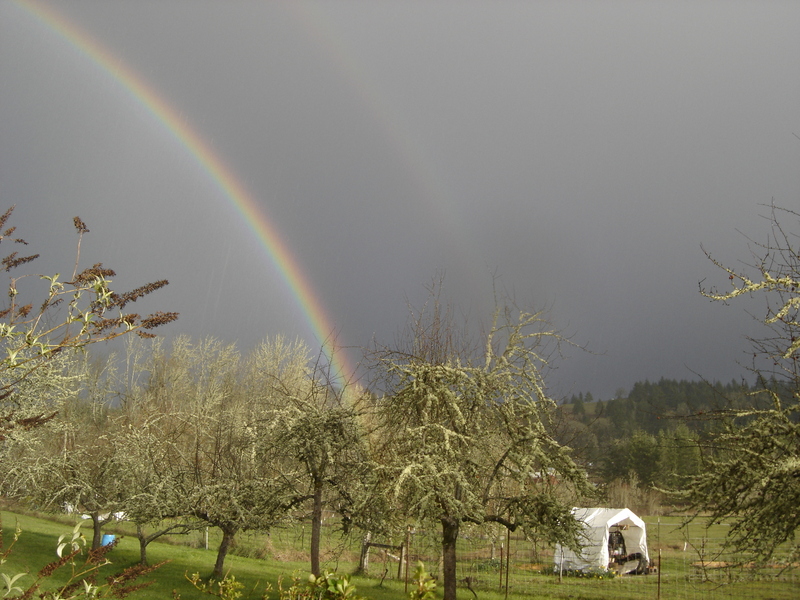 Bright sun and a passing storm two days later produced an intense rainbow, as well as a fainter second rainbow. Cirrus clouds quickly formed after sunrise one morning; the sun shone through the layer of ice crystal cirrostratus as if it were a light source behind a sintered glass filter. A quick look about the sky with polarized sunglasses revealed a bright ring around the sun, and a faint cloud bow. Nature provides a wealth of memories to those willing to take the time to look. An evening just past sundown was noteworthy, captured in mind’s eye; sound and scent will be remembered. A sliver of growing moon hung in the fading light to the west behind the thin, long sweeping tails of cirrus clouds while the first frogs of the evening tuned up for their night-long performance; the scent of geosmin rose from the damp earth. All was as it should be. 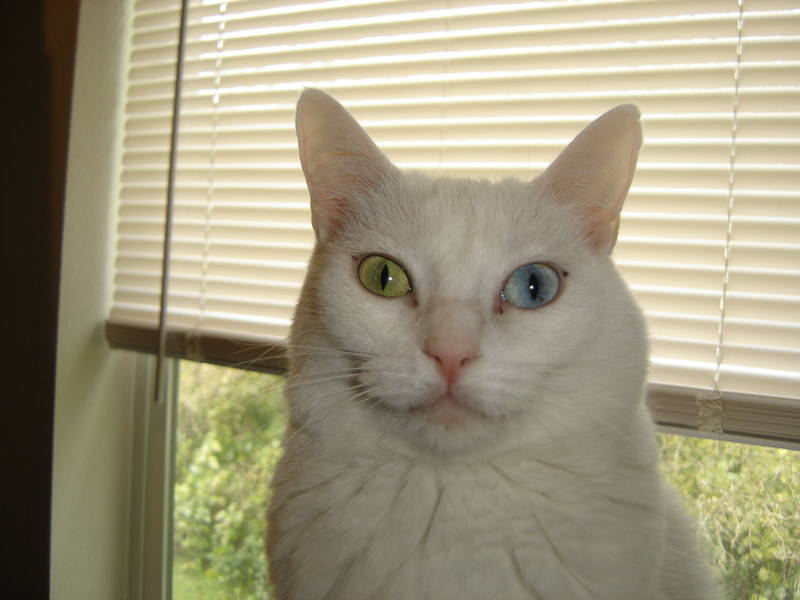 Resident Feline Correspondent Mr. Nano has called upon Correspondent Miss Nod to file her report for March. She will be 5 years old this August, and has been learning the valuable skills of observation from the crow’s nest. Very little has escaped her sharp-eyed gaze. Without further ado, Miss Nod will present her findings. Feline Correspondent Miss Nod, keeping an eye on news from the crow’s nest. 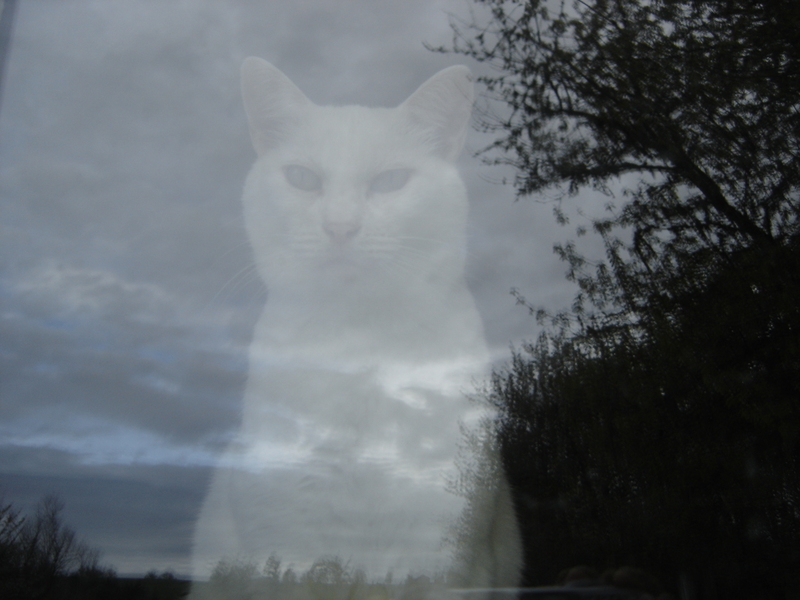 In early March, I sat transfixed one morning as frost appeared to thicken into a solid white patina and sparkle as the sun rose; perhaps the mists added to it, or it was the illusion created by Old Sol’s gaze cast upon it. The rising sun quickly dispatched Jack Frost’s handiwork; eventually the green below emerged, and all traces of the ice kingdom were gone. Our daffodils by the old garage that bloomed in January had already begun to die back in early March, while others in less protected places were in the fat bud stage, or just emerging. Mint was slowing forming shoots and leaves from wandering rootstock, still keeping low to the ground. Crocus and other spring bulbs continued to push upward into the light, while other green shoots came out of hiding like Muchkins upon discovering Dorthy was not the Wicked Witch. Another solitary daffodil among the daylilies. Morning sun after a rain presents yet another view of Nature’s handiwork, spilling gold across the green winter grass and and causing the myriad water drops clinging to branch and stem to scintillate. 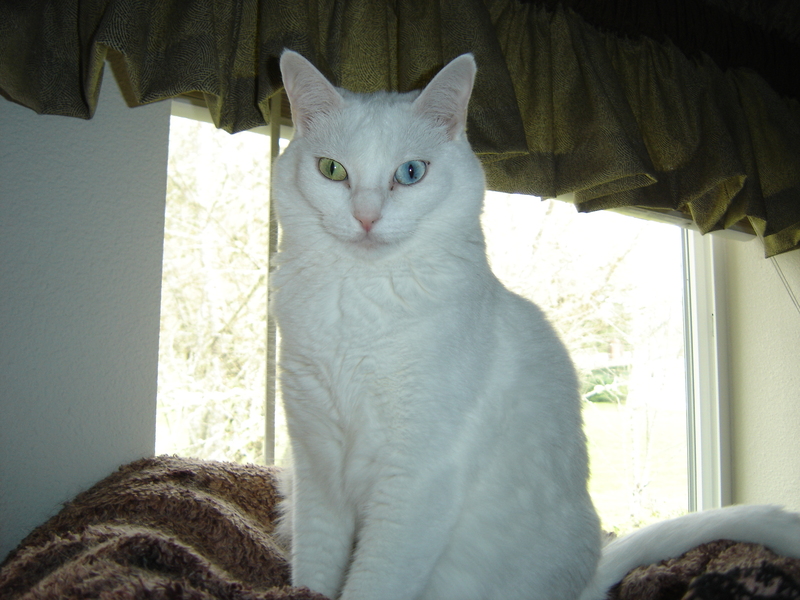 She sometimes sends us soft, rumply skies with patches of blue and hints of pastel color at daybreak, or dawn’s rosy glow on the underside of lavender-grey clouds. I recall one dawn colored in Maxfield Parrish hues and a silver-gold sliver of waning moon, captured in mind’s eye. 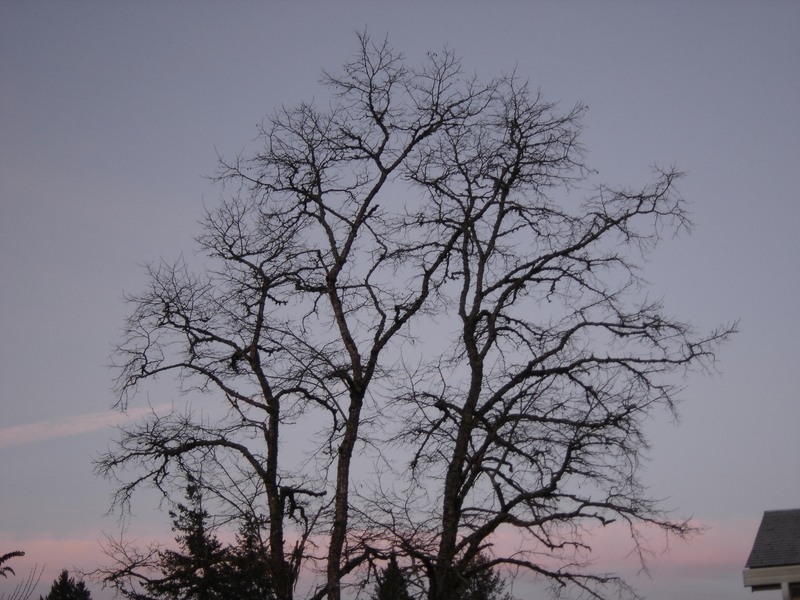 The black locust tree at dawn on the 12th. The soft clouds in the background have captured dawn’s pink glow. 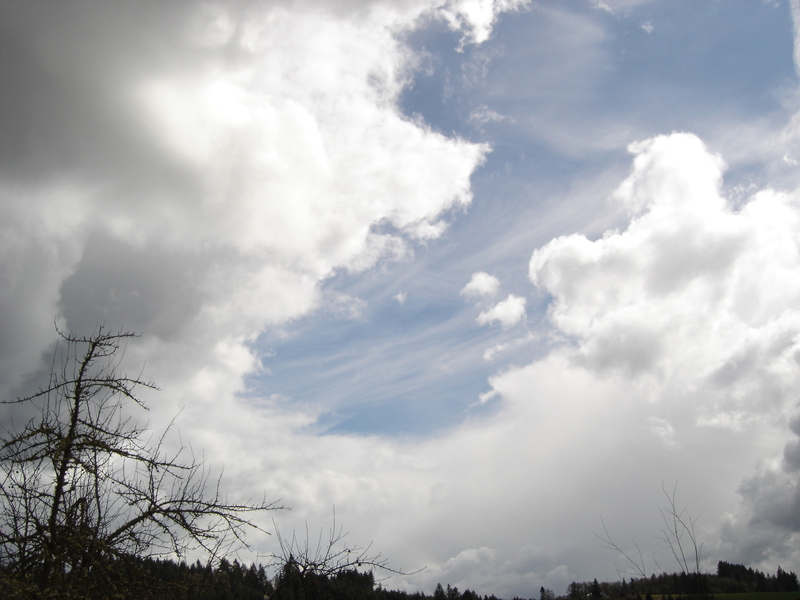 The aerial rivers of moisture that flow across the Pacific Northwest deposit a variety of cloud forms. The light plays amid the canyons created by water-swollen cumulonimbus clouds, giving a sense of texture and depth, of places to explore. Our multilevel sky on March 16th. March has presented us with two full moons, on the 1st and 31st, allowing many opportunities for observation, even on nights with intermittent cloud cover. The moon, in its last quarter, hung pale-gold in the sky. I had seen it over the southeast horizon around 3:30 AM that morning, not long after it had risen, flooding the room with pale golden light. I fell asleep again to the sound of chorus frogs cheerfully serenading the moon’s passage high above through the blackness of space. We all see the same moon, no matter where we reside, a common tie that binds us all on this one Earth we share. If only that were enough. We wish our readers a pleasant evening ahead, and safe travels to wherever their destination in life may lead them. Correspondent Miss Nod, on duty. I continue to enjoy playing out again. March has not been any more conducive to finishing projects than February, and I will make no further excuses. Things will be done when they will be done. For those readers who are new or catching up, do visit the Salmon Brook Farms YouTube channel. Our first Tiny Farm Concerts one song music video was posted at the end of March, 2017. I am 15 years older and a good bit more grey since my first and only CD was released back in 2003, but still in the saddle. It has been an interesting ride, with more to come! Do keep an eye on more content appearing from time to time. For those who have missed previous posts and wish to view the channel content, here are links to the previous two videos. In the meantime, in your area, wherever you may be, please do all you can to help keep your own local music alive. Go out and see someone you don’t know, host a house concert, download songs or buy CDs. Or even just stop for a minute to hear someone at a Farmers’ Market. Live, local musicians provide a wealth of talent most people will never hear about in this age of iPods, Internet and TV.